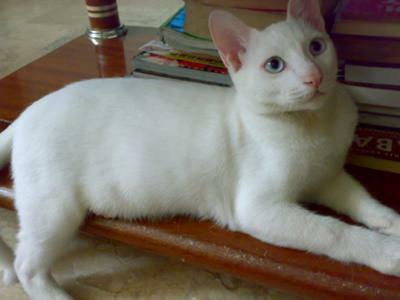 I have a cat named Micki Mao, he is pure white and blue-eyed cat. 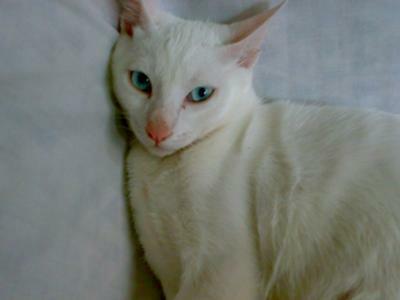 According to my search, 60-80% of a blue eyed cat is deaf but fortunately, mine is not. My friend Marianne gave it to me because she know I love cats so much..I was very happy that time. Micki mao is now 3months old and he loves to eat and sleep that's why he is fat and sometimes even he is full, he still wants to eat. Every morning when I open the window, he loves to sit there and watch the birds flying. he can sit at the window for 2hrs just to watch people and birds outside until he falls asleep lol. I love my Micki Mao because he urinate and poop at the cr. even he is sleeping when he feels to urinate, he will run to the bathroom or cr . Sometimes the living room is messy coz he loves to play news papers and plastic bags and spread anywhere but its ok, I always clean. See more pictures of Micki Mao here. Your Micki Mao is very handsome. By the time he is full grown, he will be quite the lover, I'm sure. Micki Mao is a beautiful kitty. 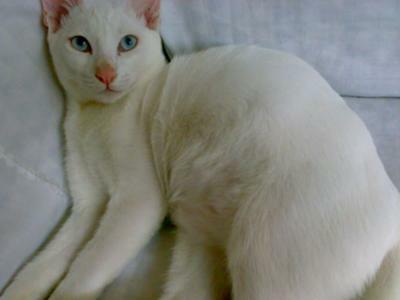 White, blue-eyed cats are my very favorite. I recently adopted one and she is 100% deaf. But she is full of life and makes everyone laugh. 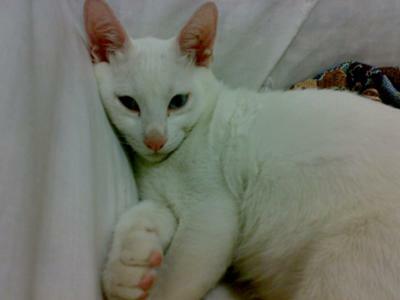 I also have a green-eyed, white cat Merlin. I hope to post updates of them soon. Pandora came home from the pound with a fungus that causes hair loss. Merlin got it too. When they are their beautiful selves again I will update Merlin and post Pandora. Thanks for sharing the beautiful pics. Micki Mao is obviously a lucky, pampered and much loved kitty as all kitties deserve.